There were a lot of laughs in the gym after our March First Friday Mass. 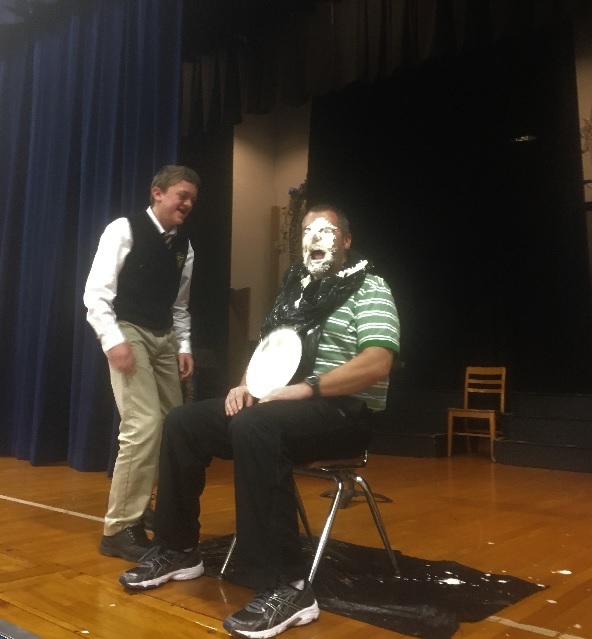 Students and faculty watched as five teachers and our Principal, Mr. Castillo, got pied in the face by students who contributed $100 or more to The Leukemia & Lymphoma Society’s (LLS) Student Series campaign to find a cure for blood cancer. Ms. Geary, Mr. Castillo, Mrs. Frith, Ms. Church, Mr. Gargiulo and Mrs. Birkmann were certainly good sports! The 6th grade also won a pizza party for donating the most money. Way to go! Ms. Kim Johnston organized this charity and fun event and was pleased to announce that our school raised over $1800 for this important research. We also had a Pajama Day for the lower grades and a Tag Day on Thursday to raise money for The Leukemia & Lymphoma Society’s (LLS) Student Series campaign. It is a part of our school’s philosophy to be ever mindful of the needs of others and to do our best to help in ways that we can. Romans 12:13 Share with the Lord’s people who are in need. Next PostNext Academy Receives Blue Ribbon School of Excellence 2017 Award!